Paul Fest performing an impromptu concert for students (Credit: Acacia Mays). Along with a flurry of new smiles and voices to acquaint oneself with, a sprinkle of tentatively sunny days, and the usual buzz of post-vacation excitement, the start of the Spring Semester at BCB brings with it a unique opportunity for new and returning students to explore the ultimately unknowable city that unfolds beyond our campus borders. This opportunity, offered to BCBers at the beginning of every semester under the innocent and unassuming name “The Berlin Weekend”, features some of the the city’s ever-changing and multifarious attractions — with a BCB twist. The program this year included guided museum and gallery visits, tours of some of the city’s neighborhoods (and cemeteries), a lecture on “Badiou and Kant’s Critique of the Power of Judgement” at the Universität der Künste Berlin, an on-campus yoga session, a theater performance about the refugee situation in Berlin, a classical music concert in the Mirror-Hall of Clärchens Ballhaus, and a student-led poetry evening. I personally chose to attend the tour of the Jewish Museum led by BCB’s very own Prof. Dr. Aya Soika and the Poetry event hosted by first-year BA student Alexandria Sisson later that Saturday (click here to find out more about People and Poetry at BCB ). The Jewish Museum was officially opened to the public in 2001. It is a strange fusion of three buildings, two of which were designed a year before the fall of the Berlin Wall by world-renowned architect Daniel Libeskind. According to Aya, it is commonly thought to be one of his greatest works. The museum deserves — and will receive — more attention than I can give it in this article, but for now let me simply describe it is a masterful architectural feat that I believe one must visit at least twice: firstly, formally, with a protective layer of people with whom to roam its halls and learn of Jewish history; next, numbly and humbly, with only one’s (physical) senses open to the experience. All those who accompanied me on the tour seemed to stand in awe of it. After some hours of contemplation, we left quietly. Conversations I had with new and returning students as the weekend progressed revealed that, overall, the program did not disappoint. “I was led by my professor Paul Festa (Pictured here with his violin ) through various graveyards in Berlin, visiting the graves of Jakob and Fanny Mendelssohn, the Brothers Grimm, Helmut Newton, Ferruccio Busoni, and, my highlight, Marlene Dietrich. 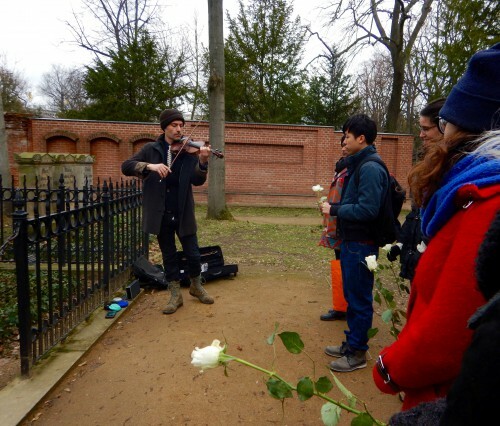 Paul made the event very special by bringing the music of these great musicians back to life in front of the plots, and bringing along roses for us to lay upon them. Later that day, my new Russian roommate, Alina Lavrova, returned from a “Multikulti” walk led by Jeffrey Champlin through with a flush of wanderlust on her face and the sort of happy tiredness that follows a day of adventure. 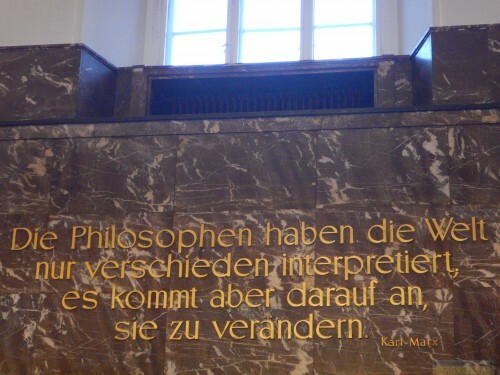 “The Philosophers have only interpreted the world differently; the point, however, is to change it.” At Humboldt Uni. This same sentiment should be applied to the performance at Maxim Gorki Theater, In Unserem Namen. I have heard from all those who went that the performance was unsettling and brilliant: It broke the fourth wall between audience and artwork by planting the performers amongst the spectators and having them jump up and surprise everyone at the beginning of the theater piece and by continuing to interact with the (would-be) spectators throughout its duration. In reflection of the performance, one of a handful of Russian exchange students at BCB this semester, Aleksandra (Sasha) Smolianskaia, expressed to me that she thinks this was done to show how the refugees here cannot be ignored and that they, too, are human. My roommate Alina, described the performance as “shocking”. She expressed that she did not enjoy the experience, but recognised that this inspiration of discomfort was likely the piece’s objective. She compared the direness of the refugee situation in Berlin to that in St. Petersburg, where, she says, refugees generally face even worse conditions and are commonly exploited for their labor. But this sort of talk brings one to the edge of a treacherous moral quagmire. How is one to compare or evaluate the magnitude of people’s suffering? Is there any one issue that deserves our attention and care more than another? And what is our responsibility, as individuals, to this omnipresent reality that we could so easily choose to ignore? These questions lurk just below the surface of the everyday happenings of our lives. As well as being an exciting way to get to know other students and the city, the multiplexity of “The Berlin Weekend” program not only allows for, but demands that we reflect on the responsibility that accompanies the privilege of a liberal arts education. It is only after such reflection that we can embrace the responsibility of our own existence and attempt to act accordingly. Happily, we can see in such things as the student-led civic engagement initiatives or the open discussion to diversify our curriculum that this is not a responsibility that we, as students, are avoiding or afraid of. Though our education and the self-reflection it demands is no doubt instrumental to living any sort of meaningful life, abstract thought can only take us so far. Ultimately, it is only through our conscious decision to act upon our realisations that will leave ripples in the flowing fabric of time.